Young children from ages 3 to 5 are in a very important developmental stage. In particular, development of their brain is at a crucial stage: They are leaving early-childhood – being toddlers – into becoming more independent children. At this age, children learn mostly through play. We make Aiki Tots Class very play-oriented, while providing your child with activities that help his or her development. Movement is very important for a young child’s brain development. Your child’s brain is working on connecting both the right and left sides. Certain types of movement activities help make these incredibly important connections. In fact, practicing the correct movements ultimately improves your child’s performance in school. The physical movement activities that lead to connecting the right and left sides of the brain bring together balance, visual perception, touch and your child’s ability to know where he or she is in space. Your child will learn these movements by focusing and paying attention. Children in our classes pay attention and focus, because they’re having fun. Children need movement to develop the neuropathways to read, spell, do math and think critically. These pathways will not develop by watching television or playing computer games. Your child must move his or her body to develop properly. At Aikido’Ka, we focus on the movements that your child needs to develop naturally and, ultimately, succeed in school. We work on coordination, balance, rolling, jumping and hopping, cooperation, respect, listening and memory. 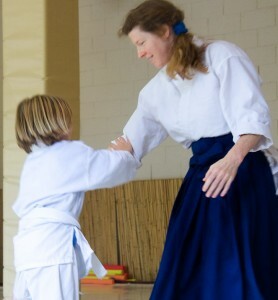 Aikido’Ka is a safe, family-friendly and fun environment. The 30 Day Free Membership does not apply to the Aiki Tots class. Is there a tots class happening? The Tots class is on hiatus. I’m not sure when the instructor will be back to teach it. I’ll let everyone know when it’s happening.